Speaking to groups of young people about your career journey and education pathway, and what work you do now. Provide information on skill requirements and possible education pathways that lead to future employment in your industry. You could do this by offering students short careers talks including a Q&A session, presenting at a career fair, or participating in events such as Speed Career Networking and ‘What’s my Line” or being involved in an ‘Inspiring Women’ activity. 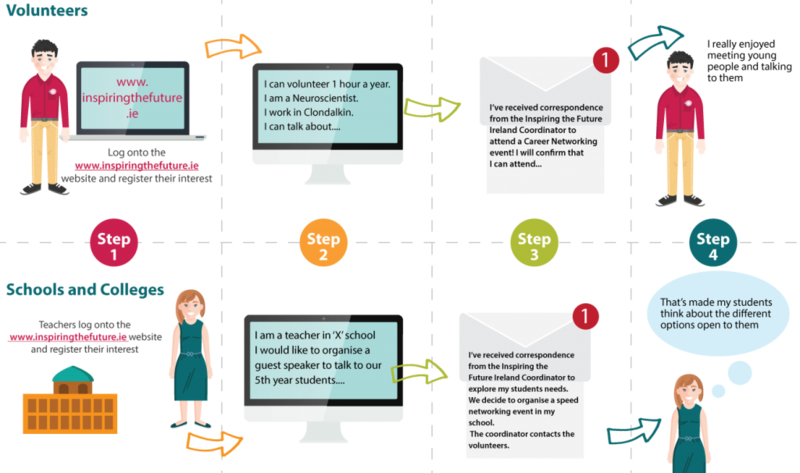 Involving yourself in consultations with teachers who seek to enrich school curriculum by offering your input to students so they can develop an appreciation of how their academic school subjects and learning activities are relevant to and are being applied in your career, workplace and industry. Giving young people feedback and advice on their CV’s – helping young people practice their communication skills in realistic mock interview scenarios for jobs, Apprenticeships, Higher Education entry etc. Reading to children or listening to them read in a primary school, either individually or in groups. Taking part in a numeracy related activity with a group of primary school children. Apprenticeship Fairs which will showcase the various career options and training opportunities available to young people through Apprenticeships. Inspiring Languages: To encourage language teachers to invite volunteers using languages in their job to talk with school and college pupils to bring classroom learning to life. These campaigns will be initiated and facilitated by the ITF coordinator as opportunities and needs arise. Please contact the ITF team if you have an idea or a need for a specific campaign/event.